The ‘#BathingIsBetter’ guidance programme from Abacus provides OTs with wide ranging and essential information to help achieve funding for an assisted bath through a Disabled Facilities Grant (DFG). When a disabled client requires specialist assistance with washing, many local authorities choose to fund adapted showering or wet room facilities instead of a bath with transfer seat or hi-lo functionality. This can be based on the preconception that accessible showering provision is more cost effective, however in many circumstances this is not the case and not appropriate for the client. If families or carers feel that a bath is essential for a disabled child or adult, then the #BathingIsBetter free advice guides, videos and social media help justify a successful DFG application. To summarise the human rights and health related benefits associated with bathing, Kate Sheehan OT, presented a seminar at the OT Show during day one of the event. Kate’s informative and engaging presentation entitled: “#BathingIsBetter – assisted bathing…choice and support’ highlighted several key factors that demonstrate why a power assisted bath is both necessary and appropriate for many clients. Kate demonstrated why bathing is an Occupation, the legislation that supports bath provision and the clinical reasoning that OTs can adopt when recommending a bathing solution. There was a Q&A session after the presentation and the seminar content is now available on the Abacus Healthcare website. 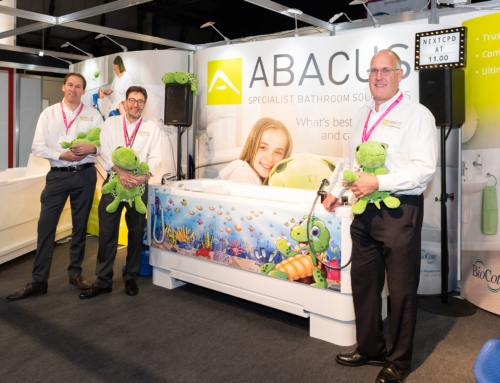 In terms of product on stand F42, Abacus demonstrated the hi-lo Gemini bath with integrated platform and the hoist-compatible Aries height adjustable bath. The Gemini is a popular choice with OTs as it is a proven solution for parents and carers of disabled children. The in-built platform ensures safety and comfort is enhanced through reduced transfers and more efficient changing and drying of the bather. Combined with the height adjustment of the bath carers can also support at safe working height so potential back injury can be avoided.